We’ve got a star on our hands today, my friends. 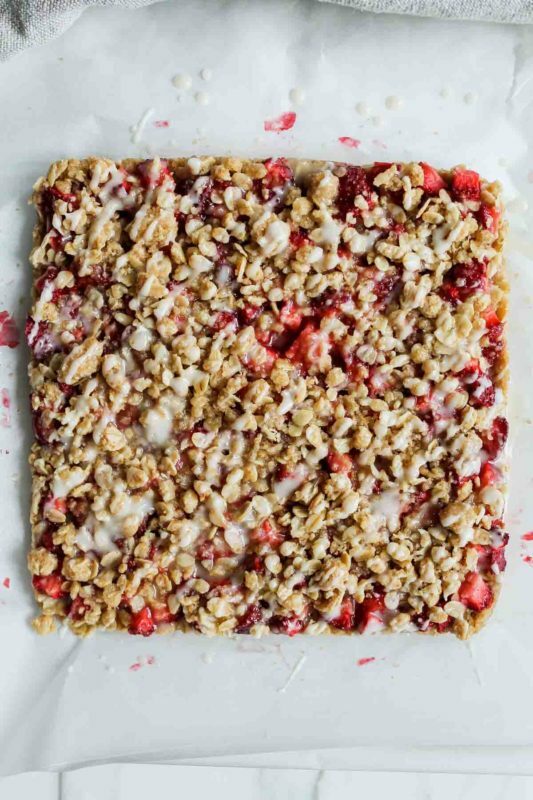 These strawberry crumble bars are dead simple to make, very few ingredients, yet taste like a summer day and (according to Brian) a super fancy Special K bar all wrapped in one. I’m not sure if that last part is really a compliment, but he meant it to be. 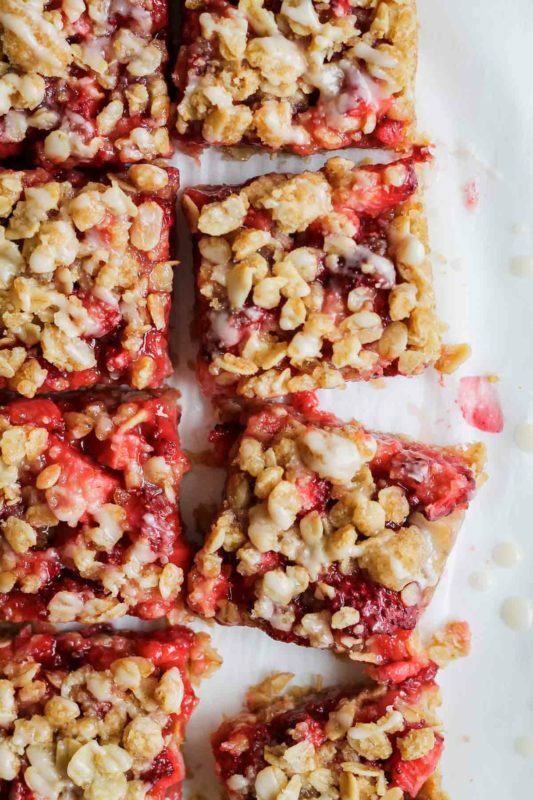 The truth is, these strawberry crumble bars did not start out as bars at all. They started out as croissants. Confusing, I know. 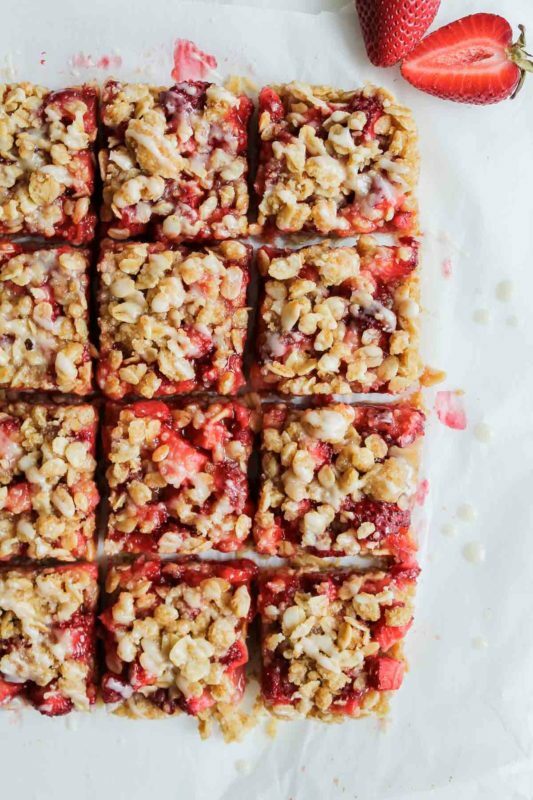 You see, I created these bars as part of a spring recipe collaboration with over 100 other talented food bloggers, and our challenge was to create a recipe featuring strawberries. I have a couple recipes on the site already that include strawberries (like scones and cake) but I wanted to create something new and exciting, and maybe you can see where this is going before I could, but I got a little overambitious. I’d seen a few videos recently on the internets concerning how to make croissants. Those light, flaky, lovely pastries that I adore but have never been brave enough to tackle myself, best leaving them to snooty French pastry chefs and the like. But Sally’s Baking Addiction’s recipe challenge this month was to bake croissants, and if you’re interested, you really should check it out – she’s the best of the best when it comes to clear baking instructions. I felt like it was a sign. So of course, in my eternal wisdom, I determined that the first time I would ever make croissants from scratch would be the time I also attempted to change the basic croissant recipe and make strawberry croissants. No, not regular croissants that have strawberries inside them — that would be far too simple and pedestrian. Croissants made with strawberry compound butter instead of normal butter. And of course, I’d first make that strawberry compound butter myself. As if croissants don’t already take long enough to make. Are you rolling your eyes at me yet? I don’t really need to tell you what happened. You already know. It was a total and unmitigated disaster. Not only did it take ALL day, ruin my apartment, and cover me and every possible surface, including my camera, in sticky strawberry butter and flour, the damn things turned out dense and floppy and somehow burned on the bottom and so un-croissant-like that you’d think I tried to make tough strawberry biscuits. Where is the crying emoji when you need it? After I’d pulled myself together and cleaned (and cleaned, and cleaned…) my apartment, I took a day off baking to reflect. I realized that in trying to execute on my grand idea of these strawberry croissants, I’d gotten carried away from what the purpose of this little blog really is. My goal is not to create Insta-famous unconventional pastries; lots of people, far more talented than me, are doing that. My goal is to create simple yet sophisticated recipes you can make any day (or at least, any weekend day) for yourself, your family, and your friends. Approachable, yet nuanced (my dad’s word for it). Ready for any occasion, even just a Tuesday on the couch. Those are my kind of recipes, and they always have been. 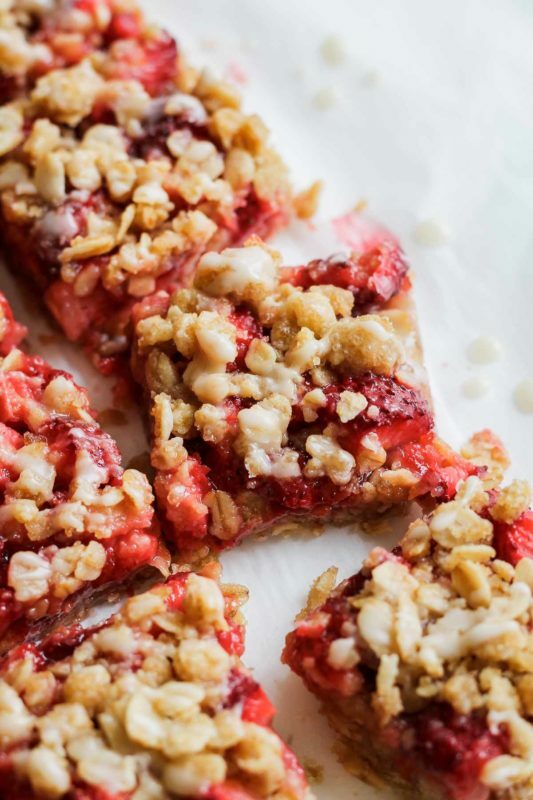 And so these strawberry crumble bars came to life. 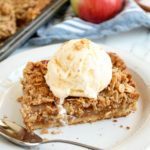 A simple oat, butter, flour and brown sugar base, which doubles as the crumble on top. Diced strawberries tossed with lemon zest, a tiny bit of sugar, and cornstarch, letting their flavor shine. A bright lemon glaze to set it off. This is my kind of baking. 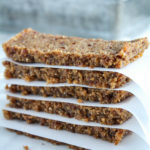 These bars are just as appropriate served with yogurt at the breakfast table as they are warmed with ice cream at dessert. You honestly can’t go wrong eating them straight out of the pan standing over the stove, either. Not that I speak from experience or anything. Like I said, Brian calls these “Special K bars on steroids” so take that for what you will. It’s true that the bright and buttery strawberry flavor is slightly reminiscent of them. You’ll just have to try them and tell me if you agree. 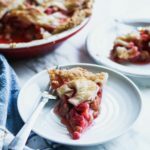 See below the recipe for links to all the other recipes from bloggers participating in our strawberry roundup! 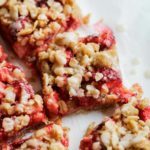 I'm fairly certain these strawberry crumble bars could pass for breakfast -- what with the oats and all -- but they're equally at ease when warm with ice cream for dessert. Your call. 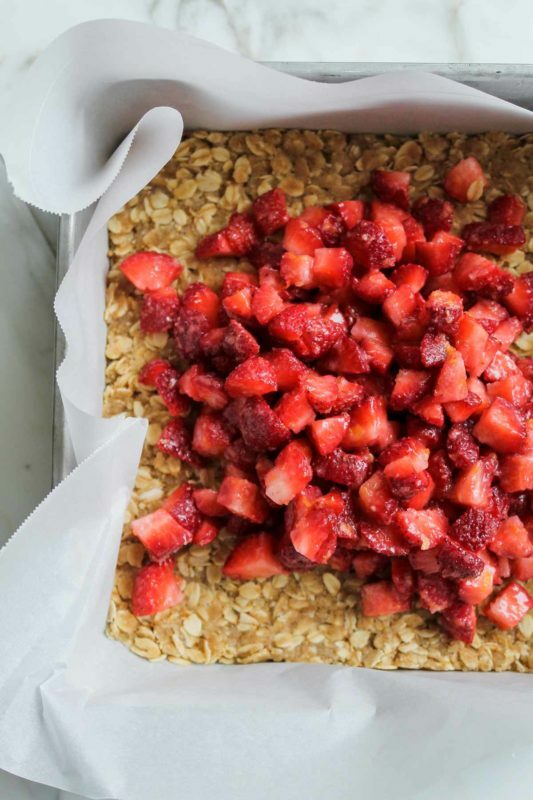 Preheat your oven to 350 degrees F. Line an 8x8 inch square pan with parchment paper (easiest method in my opinion) or grease the pan well, and set aside. 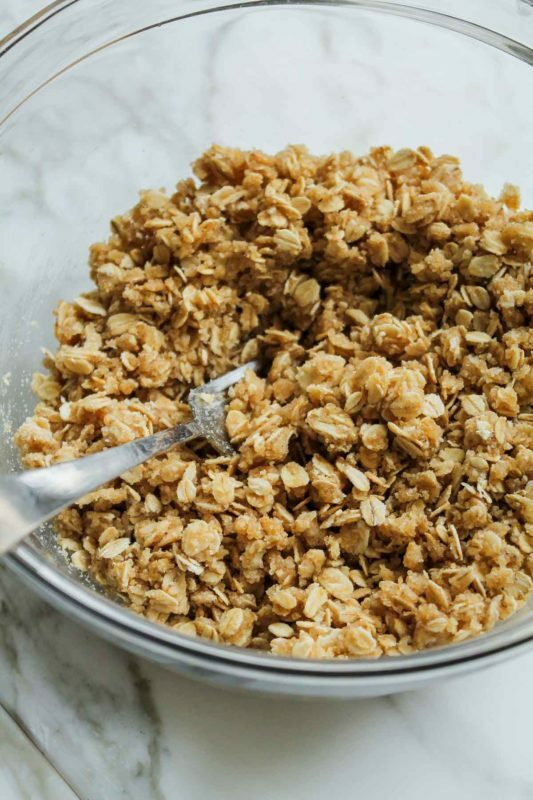 In a large bowl, whisk together oats, flour, brown sugar, and salt. Stir in melted butter and vanilla until it's a well-mixed crumble mixture. Set aside 1/3 of the mixture; pour the other 2/3 into the prepared pan and press into an even flat layer with your hands. Set aside while you prepare the filling. In a medium bowl, toss strawberries, sugar, lemon zest, and cornstarch until strawberries are completely and evenly coated. Pour mixture over top of crust and spread into an even layer. Sprinkle the remaining 1/3 crumble mixture over top of the strawberries as evenly as you can, but this isn't an exact science. Just make sure it all gets on top. 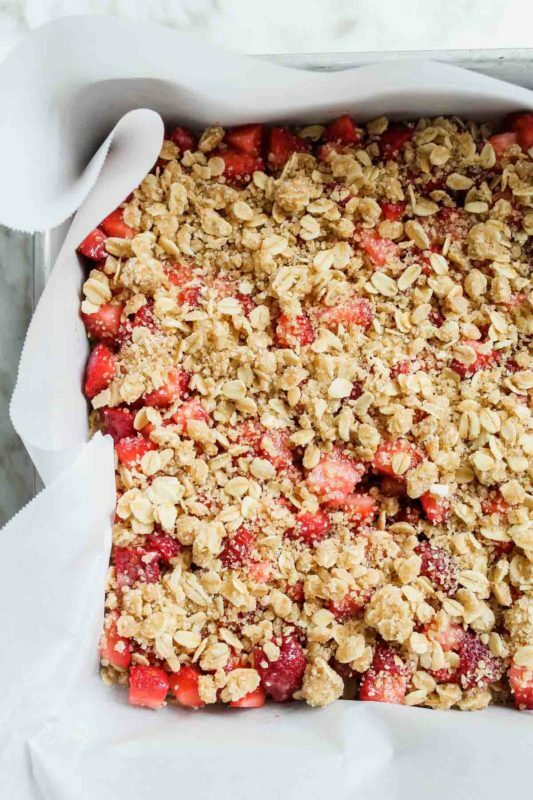 Bake for 35-37 minutes, until crumble and crust are golden and fruit may be bubbling, but it doesn't have to be. LET COOL COMPLETELY IN THE PAN (I put it in the fridge to help it along) before lifting the parchment paper from the pan to remove the bars, otherwise they will fall apart. Whisk together powdered sugar and lemon juice. 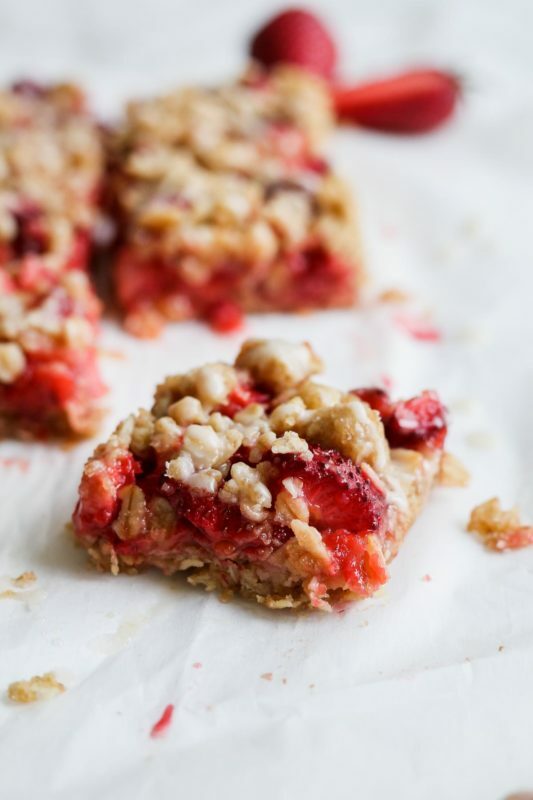 Pour over cooled crumble and cut into bars! Bars will keep, covered in the fridge, for up to 5 days. Reheat in the microwave before serving, or serve cold, whatever you prefer. 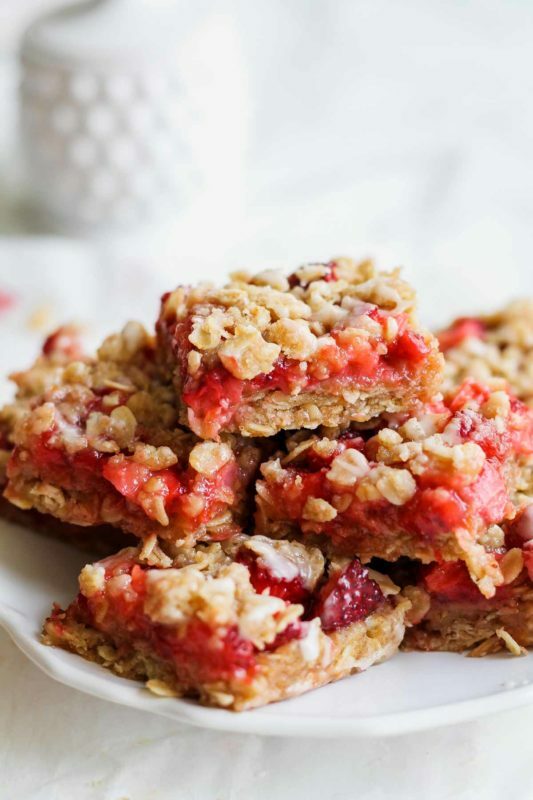 I like these bars with yogurt in the morning, or with vanilla ice cream for dessert! Like this recipe? 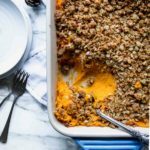 Please rate it and leave a comment or tag me on Instagram @katiebirdbakes, and sign up for my email list to receive my recipes straight to your inbox every time I post! These look delicious!! And oh my gosh I have been in that baking frustration disaster zone too and found taking the day off after is the best remedy! Think I’m gonna make these this weekend! Pinned!